Relax in a private country cottage amidst a working Pinot Noir vineyard in Anderson Valley wine country. 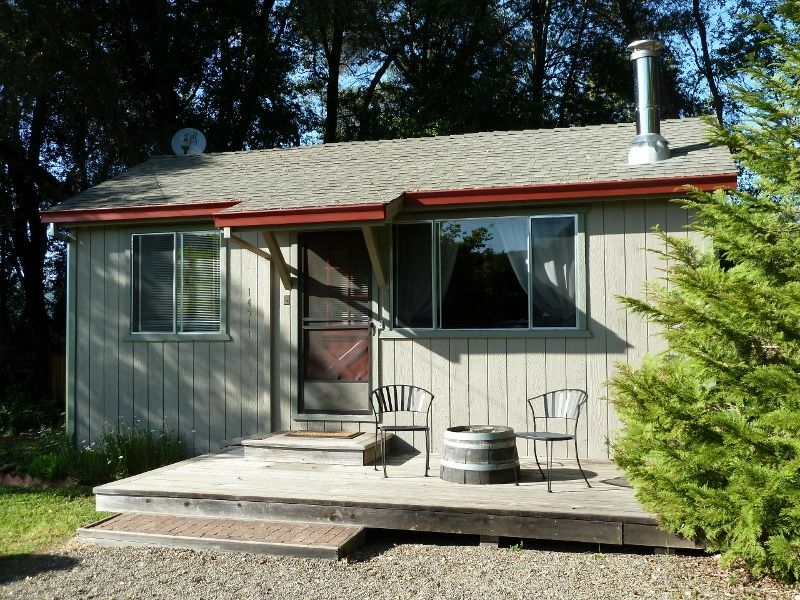 Our 2+ -bedroom, 1-bath guest house in the town of Boonville boasts a large lawn, deck, and outdoor space. One king bed, one queen bed, one single bed, central heating and air, a wood stove, and a full kitchen - perfect for two couples. The single bed is in an enclosed back porch room. The Foursight guest house is ideally located as a base for exploring Anderson Valley and the Mendocino Coast. Within 1 mile of wine tasting, dining, shopping, and a microbrewery. Enjoy leisurely Saturday farmer's markets and coffee at a local cafe, or go hiking among the redwoods in Hendy Woods State Park. Drive 30 minutes to the beach and 45 minutes to the picturesque village of Mendocino. Private tours and tastings with the owners of Foursight Wines - named a fresh new face in Pinot Noir in the September 2008 issue of Wine Spectator Magazine - are available upon request. The Charles Family has lived in Anderson Valley since 1943. Charles Ranch Vineyards was established in 2000--selling premium Pinot Noir and Sauvignon Blanc grapes to wineries in Mendocino and Sonoma counties. Foursight Wines, our family winery, was established in 2006. The Guest House was used as our original tasting room until the winery was built in 2008. Foursight Wines uses only estate grapes gown in the Charles Ranch Vineyard. The vineyard and winery are located on the same property as the Guest House. Two love seat size sofas, flat screen TV, DVD player and movies, woodstove. Wood provided. Small deck surrounding the front door with seating for 2. Side deck with dining table and extra chairs. Large lawn and outdoor area and 2 small decks, on a private road with a working vineyard, winery and tasting room. Private wine tasting and vineyard tours available. We truly enjoyed our visit. The guesthouse is extremely comfortable and cozy. Really fun to be on the winery grounds. Felt right at home. Would do it again in a heart beat! Spent 4 nights with my BFF and the experience was beyond my expectations. From the moment we pulled onto the lane that leads to the cottage I could feel relaxation. If you have interest in how the wine ends up in your glass, go, learn and experience. The cottage is clean, spacious, charming and well equipped. There are three outdoor seating options to fulfill all desires. Walking distance to everything in town. Do not miss starting your morning with coffee, sweet and savory pastries from Mosswood. Our hosts were quick to respond to our one request. Go, relax, unplug and enjoy all that the Foursight property and Anderson Valley have to offer. A quiet and super clean, small yet spacious place within easy walking distance to town. This is a lovely place with a large and open living room and kitchen. Nice outside sitting area. Everything in working order. Bedrooms on opposite sides of the house give you a lot of privacy. Stars at night are amazing. You can even see the Milky Way! The Charles Family does a great job in making folks feel like they are coming back to the guest home in the family land. Great spot off the road, rustic and quiet. Great location— can walk to town. Rustic and clean cottage with a great location— can even walk to town. Thank you Nancy for lending us your great little house in Boonville. The four of us had a great time in Anderson Valley and your house is a perfect base for exploring it. We used the thoroughly stocked kitchen and gas grill for some of our meals. Lemons Market is great for meats and fish and Velma’s fruit stand supplied us with juicy pears, melon, grapes and tomatoes. We also rediscovered the joys of playing Yahtzee thanks to your stash of games. We found the beds and living room furniture comfy. We enjoyed the view of the vineyards and the surrounding hills from the patio furniture out on the lawn. Everything was neat, clean and comfortable. We would definitely stay here again.